Nearly 59 per cent of India’s landmass is prone to moderate to severe earthquakes. And they strike without warning. Needless to say then that we need to stay prepared to deal with them. Aapda Samvaad spoke with Dr. Mahesh Tandon, a guest professor at IIT Gandhinagar and an international expert in Structural Engineering. Q. What is an earthquake? What causes earthquakes? A. The outer crust of the earth, which has a thickness of some 10 km to 50 km, consists of several tectonic plates which are not stationary. The boundaries of adjacent tectonic plates, also called “fault lines” can slip with respect to each other. A sudden slip can result in the release of an enormous amount of strain energy thereby causing severe ground shaking, which is felt as an “inter-plate” earthquake. Apart from the movements at the boundaries, the tectonic plates themselves may split or rupture and cause an “intra-plate” earthquake. Q. How long does an earthquake last? A. The main seismic action usually lasts for about 10 to 30 seconds. However, aftershocks can keep occurring thereafter. Q. Is there an earthquake season or earthquake weather? A. There is no correlation between weather/season and occurrence of earthquakes. Q. Which parts of India are prone to earthquakes? Is the frequency of earthquakes on the rise? A. The most earthquake-prone areas are in the north along the 2,400 km long Himalayan belt, the northeastern States and parts of Gujarat. Also, the south-east coast is prone to the effects of seismic sea waves (tsunamis). When we examine statistics of earthquakes of magnitude 7 and above, which are the most devastating, about 15 such earthquakes can happen in a year. There is no evidence of a dramatic variation of this figure in recent times. Q. Do many smaller quakes prevent a bigger one? A. Every earthquake releases some amount of strain energy which is built up over time. Bigger the earthquake, more the energy released. If small earthquakes keep occurring, it is good in a way because the energy build up is less. Q. What number on the Richter Scale spells danger? A. The energy released by an earthquake is represented by a number on the Richter Scale and is an indication of its potentially damaging effects. For every unit increase in the Richter Scale number, the energy released is increased 30 times. An earthquake measuring 5 represents a “moderate” shaking and some damage can take place. Magnitude of 6 to 7 is a “strong” earthquake, 7 to 8 a “major” earthquake while the one above magnitude 8 would be a “great” earthquake. Q. Do earthquakes also trigger landslides? A. The collateral damages from earthquakes can include landslides, mudflows, rock falls, avalanches and a phenomenon called “liquefaction” in which saturated soil can behave like a liquid. Q. Is it possible to predict an earthquake? What advances have been made in the field of earthquake early warning systems? A. The question of “when” will an earthquake occur has not yet been answered. Research in this area is ongoing. Scientists are even examining whether the slowing down of the earth’s rotation by a mere millisecond a day, which happens 4-5 times in a century for 5 year periods, could possibly be correlated to increased seismic activity. There could be other types of signals that may precede a major earthquake in some cases. In the 1999 Turkey earthquake (magnitude 7.6), there were 'foreshocks'. However, 'foreshocks' are not distinguishable from small earthquakes which creates the difficulty of setting the trigger value for early warning systems. Considerable progress has been made on earthquake early warning systems. Earthquake effects radiate as seismic waves in all direction from its focus through the soil/rock substratum. The speed of travel of waves can vary between 2 to 8 km/sec, of which the slower ones (called S-waves and R-waves) are the most damaging while the faster ones (called P-waves) are less so. The early warning systems exploit the difference of speed of travel of the S-waves and R-waves compared to that of the P-waves to enable taking advance action. With sophisticated instrumentation, the P-waves can be detected seconds before the more destructive waves strike in full force and the system can give out voice/audio alert messages which are triggered immediately at pre-set values of earthquake intensity. Seismic 'switches', which can shut off valves of gas pipelines, elevators of tall buildings and trip the movement of trains, are already in use. Q: Can we reduce the damaging effects of an earthquake? A. We cannot prevent earthquakes from occurring. 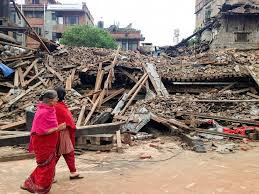 However, we can mitigate their effects considerably by identifying possible direct hazards as well as indirect effects such as landslides, building safer structures by following codes of practice and dissemination of knowledge about earthquake safety. Q. What precautions measures should be taken after an earthquake? A. 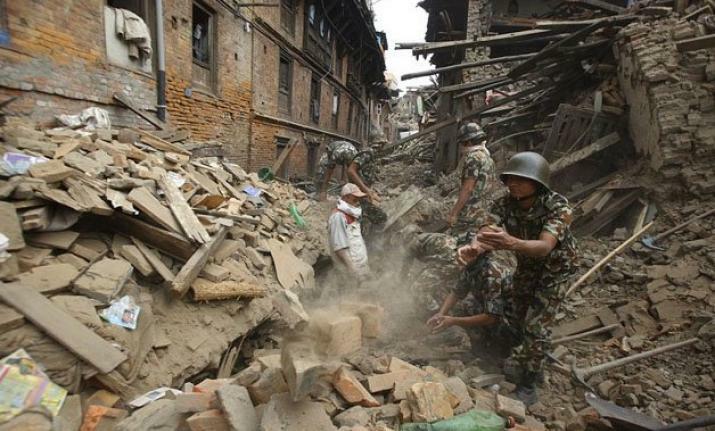 In the post-earthquake scenario, the protection of life and property takes centre stage. The National Disaster Management Authority (NDMA) is the apex body mandated to lay down the policies, plans and guidelines for disaster management to ensure timely and effective response to disasters, including earthquakes. Since the effects may cover large areas, satellite imagery, aerial survey and remote sensing can be used for quick assessment of the extent and distribution of damages. Indian Space Research Organisation (ISRO) satellites have opened up the possibilities of such an assessment which were not available at the time of the 7.9 magnitude Bhuj earthquake in 2001. The long-term response includes relief and rehabilitation measures as well as education, training and capacity building. Q. How should earthquake resistant houses be built? Also, can already standing structures be made earthquake resilient? How? A. Earthquake resistant houses can be built by following codes and guidelines published by the Bureau of Indian Standards (BIS) for different types of buildings. Apart from strengthening measures, preliminary evaluation and Rapid Visual Screening (RVS) are also included as part of these Guidelines. Modern techniques include the use of materials like fibre-reinforced polymers (FRP) which can be implemented with less difficulty and disturbance compared to the conventional methods like concrete jacketing, adding steel plates and reinforcements, etc. Q. What is the epicentre of an earthquake? How is it zeroed in on? A. Earthquakes are usually generated several kilometres below ground. The point of origin is called focus of the earthquake. The point vertically above that at ground level is called its epicentre. The instrument that measures an earthquake shaking is called a seismogram. Seismograms are distributed all over the globe, many of them forming a part of digital seismic networks. Some organisations install and operate a multi-use scientific facility as a societal resource for Earth observations, monitoring, research, and education. In India, the India Meteorological Department (IMD), as of 2015, has a data centre in Delhi and maintains the National Seismological Network consisting of 55 observatories spread over the entire country. Seismic activity is monitored on a 24X7 basis and information disseminated to the Centre, concerned State Governments as well as other user agencies like the NDMA. Q. How does the depth of a quake affect the damage caused by it? A. Earthquake waves radiate from the focus and travel through the intervening substrate before reaching a particular structure. The waves cause horizontal as well as vertical forces on the structure. The magnitude of forces and their characteristics are dependent on the properties of strata that they travel through before reaching the structure. Q. Do the positions of the moon, the sun and other planets have an effect on earth's seismicity? A. The position of the moon, sun and other planets have a slight influence on the gravitational field of the earth. Also, we know that semi-diurnal ocean tides (two high tides and two low tides in a day) are correlated to the position of the moon with respect to the earth. In addition, there are special cases of lunar and solar eclipses, although these events do not affect the semi-diurnal tides. Planetary alignments are a part of the ever-changing configuration of the solar system of which earth is an integral part. Despite the knowledge of the above phenomena, there is as yet no scientific evidence that earthquakes can be related to any one or multiple occurrences of the same. 1. Comments will be moderated by NDMA'seditorial team. 2. Comments that are abusive, personal, incendiary or irrelevant cannot be published. 3. Please write complete sentences. Do not type comments in all capital letters, or in all lower case letters, or using abbreviated text. (example: u cannot substitute for you, d is not 'the', n is not 'and'). 4. We may remove hyperlinks within comments. 5. Please use a genuine email ID and provide your name, to avoid rejection.